Wherever that car is going, it's not going to end well. It's 500 years in the future, and the world is ruled by SovKhan, whose base of operations is in the vast city complex known as Megacity S1-9. Out to stop his tyrannical rule is a group of resistance warriors descended from an ancient group of warriors called the Guardians. This fight seems rather one-sided, since SovKhan's forces are bolstered heavily by the use of 60-foot tall biomechanical Humongous Mechas known as Evangeli- sorry, "Slaves", grown from cybernetic embryos and a piece of Applied Phlebotinum known as NTR95879, or "dark matter". However, hope arrives to the guardians by way of a captured Slave unit called "Slave Zero", who is not only the original Slave that all the other slaves have been cloned from, but has also had a resistance member's mind permanently uploaded into its brain. What follows is an urban rampage through various assorted cyberpunk cityscapes, with a nice assortment of gun combat, shoulder-mounted missiles, and plenty of terrain destruction. 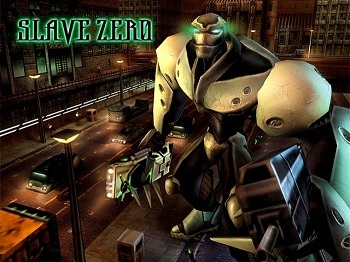 Such is the story of Slave Zero, a Mecha Game heavily influenced by the style of shows such as Neon Genesis Evangelion. Released originally in 1999 by Infogrames, with development helmed by Accolade, the game was originally marketed on the technology behind Accolade's "Ecstasy" engine, but was a commercial flop in the wake of the game's initially lukewarm reception, and ended up being the only game made with the engine. The PC version of the game has since been released on GoG by Tommo, Inc., and on Steam by Night Dive Studios. Absurdly Sharp Claws: Slave Zero itself, although more for decoration than as a weapon. A Mech by Any Other Name: "Slaves". Awesome, but Impractical: Throwing cars as a means of attack, especially considering Slave Zero already has a missile launcher. The first person perspective, since it's obvious the game was designed with a third person in mind, and the first-person perspective merely comes across as an attempt to ape Shogo: Mobile Armor Division. Cyber Punk: Darkened cityscapes, neon billboards and all. Degraded Boss: The Piranha Sentinel is treated as a boss in the first level, complete with boss healthbar and introductory cutscenes, but it becomes a generic enemy as early as the third level. Everything Breaks: Certain buildings can be destroyed to reveal pickups. Game-Breaking Bug: Like several other games in this era, the initial release was hard-coded to assume that D: was the optical drive used to install the game, and would give a "no disc" error if the drive had any other letter. Fortunately, this was corrected in a patch, and it's naturally a non-issue with the GoG version. Gangsta Style: How Slave Zero wields the one-handed guns. Guns Akimbo: Slave Zero is depicted wielding two of the initial machine guns, though you can't do this in-game. Mook Maker: The Slave unit lifts, which can be destroyed to stop spawning in enemies. Obvious Beta: The Dreamcast port. All of the in-game music is removed with only the intro and ending themes remaining, the menus in languages other than English are glitched and not fully translated, the framerate is far lower than the PC version and dips inexplicably during the cutscenes and the game is filled with all manner of bizarre bugs, such as falling infinitely off a bottomless pit or getting killed by the checkpoint transition and becoming invincible as a result. The existence of other far superior PC-to-Dreamcast ports showed that Infogrames plainly didn't care and rushed the Dreamcast port to get a quick buck. Organic Technology: The Slave units are this trope, given the fact that they're said to be "grown" rather than simply "manufactured". Powerup Let Down: The fourth-tier Energy Weapon fires a continuous laser beam that eats through your entire ammo store in seconds and does far less than its predecessor, a powerful sniper rifle that can two-shot a Titan-class Sentinal while using hardly any ammo at all. Similarly, the third-tier Machine Gun does heavy damage, but rapidly chews through your ammo. And its fourth tier is a single-shot cannon that, while doing descent damage, fires in an arc, making incredibly difficult to hit distant targets. Rewarding Vandalism: Ammo and health can be found by destroying small buildings. Unwinnableby Mistake: Unless one pick up the Valhalla rocket launchernote which most players are likely not to, as the game defaults to "only pick up upgrades" for weapon selection and the Valhalla is superseded by the homing Zulu rocket launcher., the Final Boss is unbeatable on hard mode as he has more health than there is ammo available. There is additional ammunition embedded in the walls, and supply drops that should provide ammo but instead are passive decorations that can be walked through, both of which would have helped. Video Game Cruelty Potential: Aside from the two main weapons and rocket launcher, another means of attack is the ability to pick up cars and pedestrians and throw them.